🇫🇷 Good Thursday morning from Cannes — headed home today. Situational awareness: President Trump plans to meet Russian President Vladimir Putin during a visit to Europe next month, likely in Vienna, according to The Times of London. The plan appalls U.K. officials and adds to fears about Trump’s commitment to NATO. The Pope, the U.N., Bono, every living first lady (including his wife), a conservative radio host (Hugh Hewitt) who said this could be his Katrina, a Republican senator (Ted Cruz), a top aide (Kellyanne Conway), his oldest daughter. 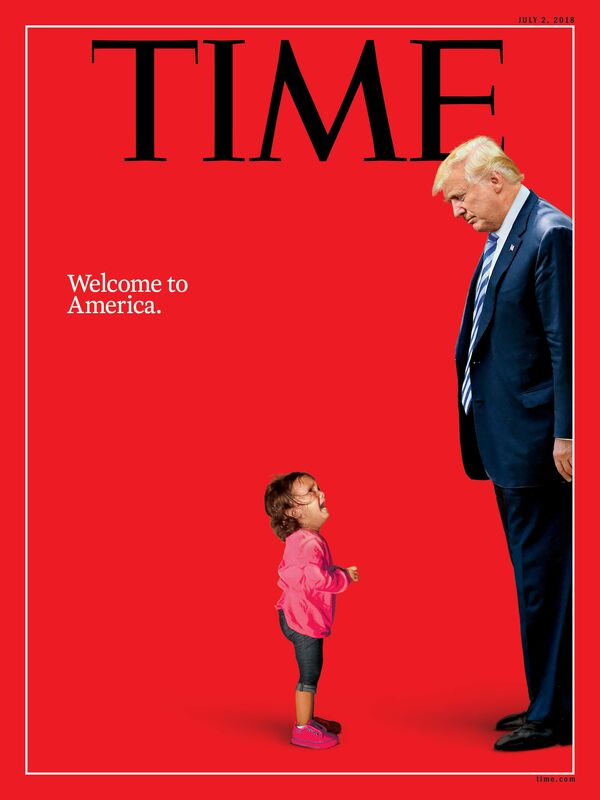 Their condemnation and concern about caged kids at the border left Trump realizing he had a massive problem. But none of them convinced him to cave. TV was the tipping point. A person who knows Trump's mind told me: "The President watches more cable news than most Americans. So he experienced an overdose of the outrage and the media frenzy. None of the White House messaging seemed to be helping. So he decided, mostly on his own rather than at the urging of advisers, that some action was required to change the narrative." 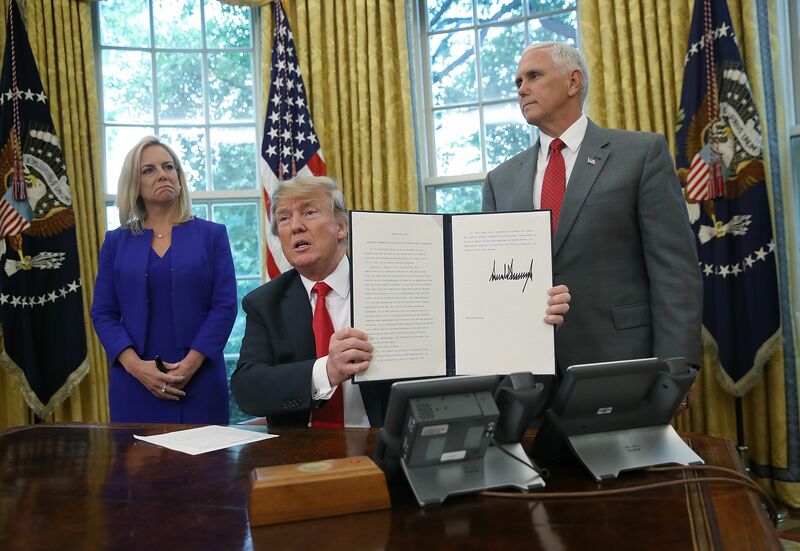 So in a dramatic retreat he had hoped to avoid, Trump signed an executive order ending the administration's policy of separating children at the southern border if their parents were caught entering the U.S. illegally. The details, via AP: "The order does not end the 'zero-tolerance' policy that criminally prosecutes all adults caught crossing the border illegally. But, at least for the next few weeks, it would keep families together while they are in custody, expedite their cases and ask the Defense Department to help house them. It also doesn’t change anything yet for the some 2,300 children taken from their families since the policy was put into place." Trump continued to talk tough on immigration during a rally last night in Duluth, Minn.: "We’re going to keep families together and the border is going to be just as tough as it’s been." The crowd chanted: "Build the wall!" Mark Penn of The Stagwell Group, an expert on swing voters who has counseled the Clintons and top corporations, told me that outrage about the policy had blunted the momentum Trump was enjoying from the economy and the North Korea summit. Penn: "This goes right at these independent women that he needs to hold onto — the moms of America who voted for Trump. Remember that most independent suburban women voted Trump. This did the most damage with exactly that group." Be smart ... A source close to Trump tells me: 'This was the biggest communications fail I’ve seen out of this White House, and that’s really saying something. 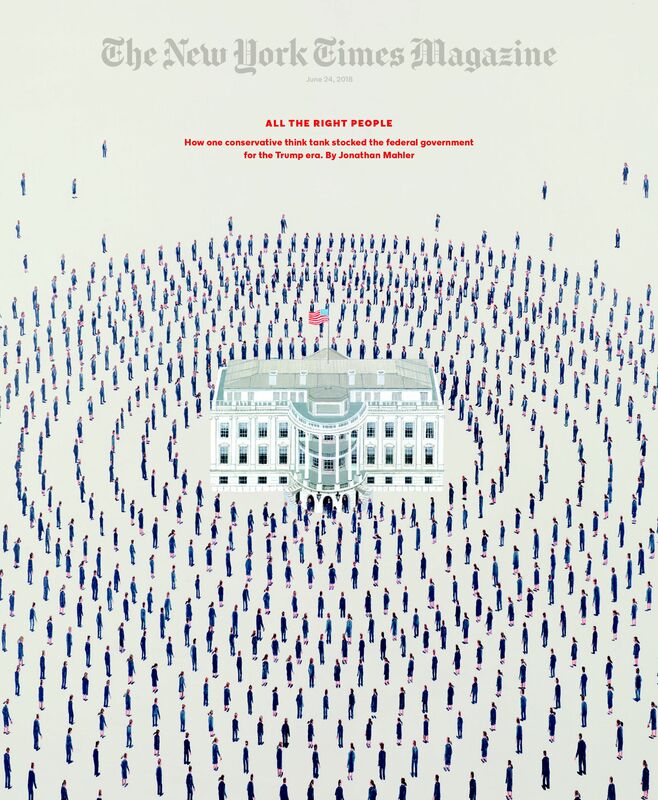 The President, senior staffers, Cabinet members, and outside surrogates all trumpeted different talking points." "Immigration is a political battleground that typically gives the administration the upper hand. But they gave up home-field advantage on an epic scale." Video from N.Y. Times: Last night, "a group of seven boys, who appeared to be unaccompanied migrant children, arrived at New York’s La Guardia Airport from Texas amid a debate about the separation of minors." So many sad, panicked people on the move ... The Rohingya forced out of Myanmar to Bangladesh ... teenagers from Mexico and Central America seeking safety in the United States ... Syria's war refugees ... men from South Sudan and Nigeria crossing the Mediterranean Sea to feed their families. The U.N. "refugee agency reported this week that nearly 69 million people were forcibly displaced in 2017, a record for the fifth straight year." "While migration to the world's 35 richest countries dropped slightly last year for the first time since 2011, asylum claims rose by 26% in the United States, according to a new report from the Organization for Economic Cooperation and Development, which represents the wealthy nations." "[L]eaders of European Union member countries are trying anew to come up with continent-wide solutions to a mass migration crisis that has pitted nations and politicians against each other." "In a sign of the continued divisions, Hungary marked World Refugee Day [yesterday] by approving measures making it harder to obtain asylum and threatening a prison sentence for those who help asylum-seekers." Be smart, from the N.Y. Times' Megan Specia: "[T]he vast majority of the world’s refugees have not gone very far and are largely living in neighboring countries." 3. Can Americans "be numbed to just about anything?" On how Trump differs from past presidents, TIME's Karl Vick writes: “For the first 240 years of U.S. history, ... our most revered chief executives reliably articulated a set of high-minded, humanist values that bound together a diverse nation by naming what we aspired to: democracy, humanity, equality. ... Donald Trump doesn’t talk like that." 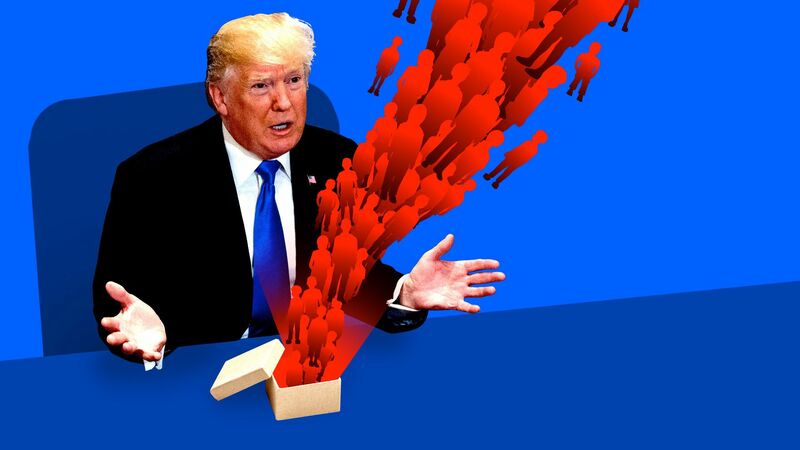 On this pivotal moment of Trump’s presidency, TIME's Molly Ball writes: “The inhumanity unfolding at the border has not just been a test for Trump. It has been, and will continue to be, a moment of reckoning for America. Trump ... thinks ... that the American people can be numbed to just about anything. If there is a Trump creed, it’s that there’s no such thing as going too far. That may have found its limit with putting children in cages." P.S. Pulling back the camera: "The politics of rage that animated Mr. Trump’s political rise now dominate the national conversation, as demonstrated repeatedly during the debate over his 'zero tolerance' immigration policy," the N.Y. Times' Peter Baker and Katie Rogers write in a front-page White House Memo, "Incivility Infests Life in the U.S. On Trump’s Cue." "An announcement is planned [this] morning, after a monthslong review of cabinet agencies with an eye toward shrinking the federal government." "The changes would require approval from Congress, but it isn’t clear that lawmakers have the appetite to undertake a far-reaching reorganization, especially at this point in the political calendar." Why it matters: "Streamlining the executive branch has been a longtime conservative goal. The new plan also meshes with the administration’s priority of retooling higher-education programs to train students more directly to join the workforce." Amid sounds and images of families being separated, there's been a big jump in the past week in the percentage of Americans who say immigration is the most important issue facing the country, according to a new Axios/SurveyMonkey poll. Why it matters: It's mostly Democrats who have shifted (up 10 points since last week) and, to a lesser extent, independents (up four points) — a sign that they're getting energized by the coverage. The survey was conducted before President Trump signed yesterday's executive order. The big question: Whether Democrats will stay as interested as Republicans, who have consistently ranked immigration as a much higher priority. Former New York Mayor Mike Bloomberg "has approved a plan to pour at least $80 million into the 2018 election, with the bulk of that money going to support Democratic congressional candidates," the N.Y. Times' Alex Burns reports. From Bloomberg's statement: "I have plenty of disagreements with some Democrats, especially those who seek to make this election about impeachment. Nothing could be more irresponsible." "But I believe that ‘We the People’ cannot afford to elect another Congress that lacks the courage to reach across the aisle and the independence to assert its constitutional authority. And so I will support Democratic candidates who are committed to doing both." Be smart: Bloomberg's commitment is a step toward running for president as a Democrat in 2020, and some longtime allies think/hope he might get the band back together. "[T]he two heavyweights of the Chinese Internet industry, Alibaba and Tencent ... [each] have market capitalizations that hover around half a trillion U.S. dollars." "Both command sectors of the rapidly growing Chinese digital landscape: Tencent owns the leading gaming and messaging platform, while Alibaba rules e-commerce. 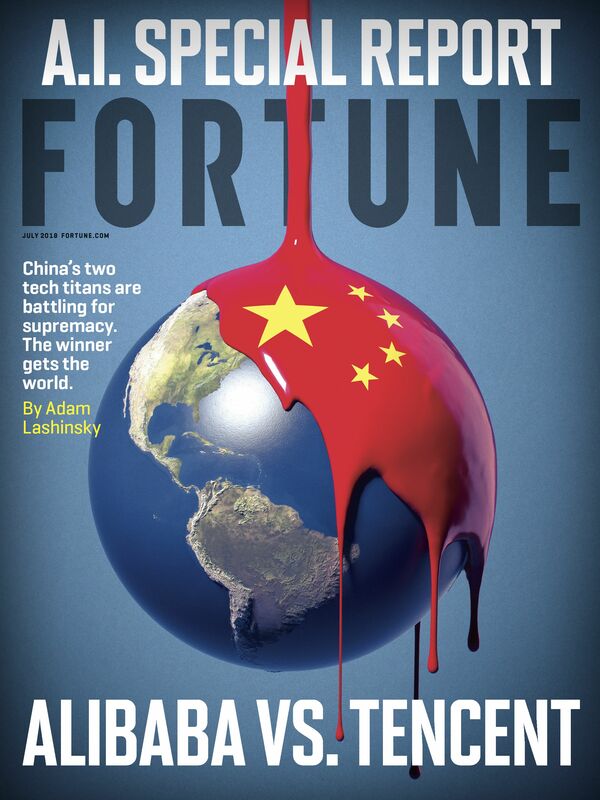 Both are aggressive investors inside and outside China." "[B]oth touch an astounding percentage of the world’s most populous country: Alibaba’s various online marketplaces count 552 million active customers; Tencent’s WeChat messaging service recently surpassed 1 billion accounts." "[A]s they’ve grown, each inevitably has begun to encroach on the other’s turf. Tencent ... is investing in retail and financial services, sectors that are Alibaba’s strength. Alibaba in turn sees an opening in Tencent’s domain, particularly by offering mobile-messaging tools." "Their top leaders share a surname, though Alibaba’s Jack Ma and Tencent’s Pony Ma aren’t related." "The American economy has picked up speed and is now on course to expand this year at the fastest rate in more than a decade," N.Y. Times economics writer Nelson Schwartz reports in a front-pager, "Economic Surge Gives President More Firepower in Trade Battle." "[R]ecent surveys and other data show that people are bullish about the economy’s trajectory." "Owners of small businesses are also confident — about their own prospects and about the overall economy." Be smart: "Tariffs could hurt the American economy by stoking inflation without increasing wages. ... [But t]rade wars won’t sharply curtail economic activity, unless they cause businesses to lose confidence." "Trump had no personal connection to the think tank and had fared poorly on a 'Presidential Platform Review' from its sister lobbying shop, Heritage Action for America, which essentially concluded that he wasn’t even a conservative." "Much like Trump’s, Heritage’s constituency is equal parts donor class and populist base. Its $80 million annual budget depends on six-figure donations from rich Republicans." Duran Duran's John Taylor and Nick Rhodes stopped by a Snapchat exhibit in Cannes, France, yesterday to play a keyboard (I tried it) that lights up the wall with Snaps that correspond to the notes you're playing. For 35 years, Marclay has been transforming sounds and music into visible, physical form through musical performance, recording, collage, sculpture, installation, photography and video. 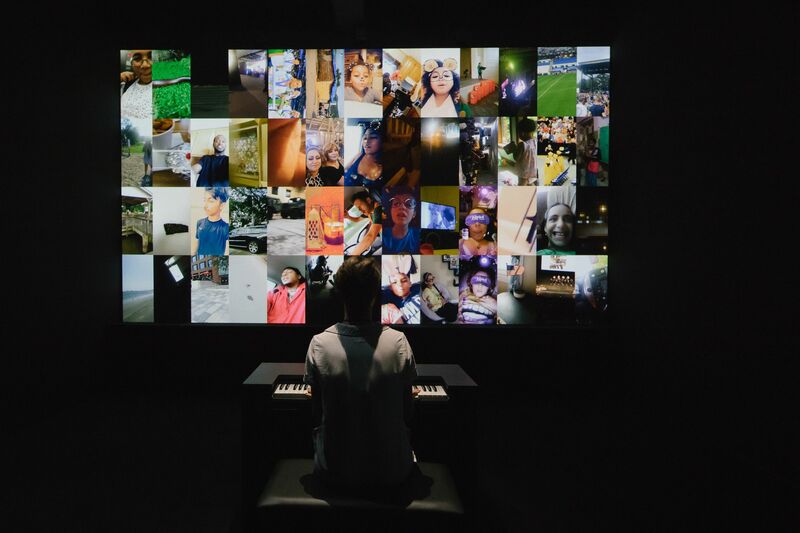 With the help of algorithms created by a team of Snap engineers, Marclay dipped into hundreds of millions of Snapchat videos posted to Snap’s public “Our Story” to create five immersive installations. "All Together" features over 400 Snaps, sequenced by Marclay to create a sound composition across 10 smartphones displayed on a curved wall. 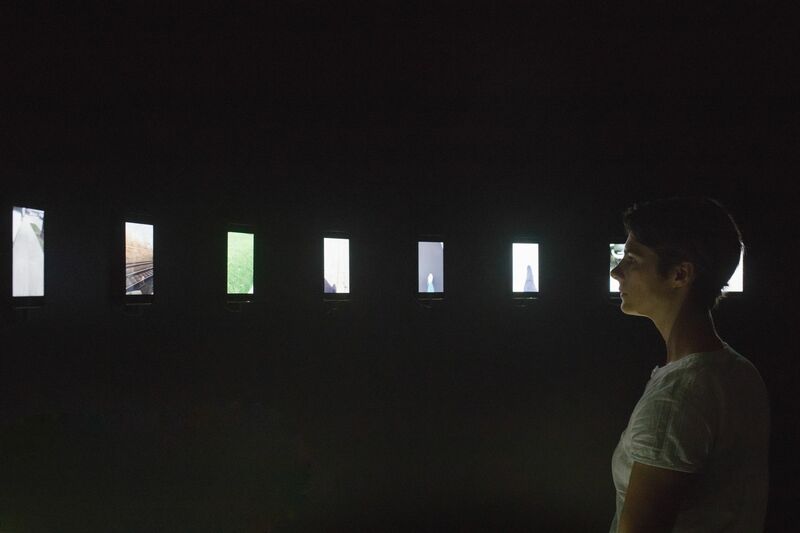 The small screens and their internal speakers create an intimate and spatial orchestra of synchronized found sounds and images, culled from the everyday moments publicly shared on Snapchat. At "The Organ," visitors are invited to play a keyboard in the center of the room. "The Organ" draws from a library of millions of raw, publicly-posted Snaps, organized by the pitch of their audio. The keys of the interactive keyboard trigger a set of Snaps that closely match each musical note played. Go deeper, via the N.Y. Times.